Looking for a dinner that transports you to the Caribbean, warms you up like comfort food, and is still healthy? Yeah, I didn’t think so — that would be an odd request to make of dinner. But, even if you weren’t looking, it’s a great feeling to have, and it’s exactly what Post Punk Kitchen’s Curried Black Eyed Peas delivers. I’ve read about her book, Appetite for Reduction: 125 Fast and Filling Low-Fat Vegan Recipes, a couple of places, and I was intrigued. I’m the furthest thing you can find from a vegan, but once in a blue moon on accident I’ll make something vegan, and I like it. So it’s been an area I’ve thought about dabbling in. I just get scared off by recipes that include nutritional yeast and tempeh. One day a friend of mine mentioned she had been using this cookbook and loved it, but then she pointed me toward the site. I spent the better half of the day trying to decide what I would cook that night. Did I want to go crazy and throw “gluten free” in the mix? Well, that’s what I ended up doing. Overall, this dish was amazing. I made it with brown rice, which I have yet to cook properly, so next time I’ll just stick with white. 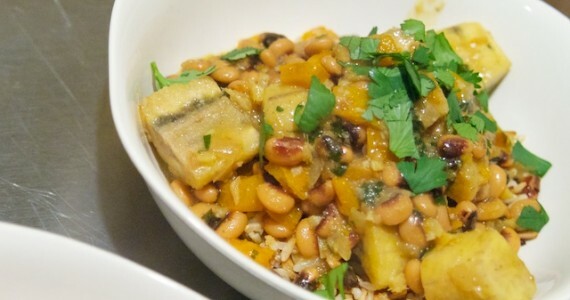 The flavors were that of a typical curry, but the creaminess of the black-eyed peas made this a stand out dish. Note: If your plantains aren’t brown/very ripe, they will benefit from being steamed first. You can do this in the microwave with a covered dish and a generous splash of water, or in a traditional stove-top steamer. I would also highly recommend adding 1 to 2 teaspoons of sugar if this is the case, as noted in the recipe. Heat oil in a heavy bottomed skillet over medium heat. Saute the shallot, red pepper and habanero in the oil for about 5 minutes, until softened. Add the garlic, ginger, plantains, bay leaf, star anise, curry powder, cinnamon, salt, and thyme stems and saute until the plantains are softening and just starting to stick to the bottom of the pan. Add the coconut milk and water and scrape the bottom of the pan to deglaze. Add the black eyed peas, stirring thoroughly, and bring to a simmer for 10 to 15 minutes, until the flavors meld. Add sugar, if using, and lime, stirring to combine. Taste for salt and seasoning and adjust if necessary. Remove thyme stems, star anise and bay leaves. To serve, ladle curry over rice and top with plantains. Carnivore variation: Make this a more traditional beans and rice affair by adding grilled sausage on the side. Aidell’s Spicy Mango with Jalapeño chicken sausage is a perfect match with it’s mild, sweet and savory flavors.